No matter how orthodox and customisation-free you want your Dynamics CRM implementation to be, there is always one aspect of Dynamics CRM that must be customised: The Sales Pipeline. Such customisation is required if you want the default sales pipeline to work properly, as well the sales pipeline report. The issue at hand is, how can we set-up a functional sales pipeline with charts and reports, yet keeping Dynamics CRM as close as possible to its out-of-the-box functionality? Which fields should we use and how should we design our workflows? Dynamics CRM is indeed a fantastic tool and one of my favourite products out there. Now with Dynamics CRM 2011 concept of xRM (“anything” Relationship Management), the application can be truly extended beyond the conventional “customer relationship management” model. However, one must not forget the core constant in which Dynamics CRM has been architected: Relationship Management. Companies willing to implement Dynamics CRM 2011 must decide whether to deploy it in their own infrastructure (on-premises) or to implement it at Microsoft’s dynamics.com cloud offering (on-demand). Normally people consider that both solutions go on-pair with each-other and that the bottom line decision should be based on cost. Earlier this year, I bumped into an odd behaviour in Dynamics CRM 2011, which has been recently confirmed by Microsoft to be a bug. This has been the first bug I found in Dynamics CRM 2011 and I was hoping it would be the last since I wasn’t proactively hunting for bugs. Then I came across another odd behaviour, which has been flagged by my users. The issue concerns the dynamic filtering of list views not behaving as expected when interacting with grouped charts containing multiple series. However this one Microsoft insists it is by design. I’d like to see what others have to say about it, though. Looking into my bookmarks I came across an old forum post about when to use Teams or Queues for assigning activities. AniMandal from XRM Adventures blog came to the rescue providing an insightful answer on how and when to assign activities to teams, queues or directly to a specific user. You can find the answer on Microsoft’s Dynamics CRM forum here. Not sure if I should be happy about it, but a couple of months ago I discovered my first bug in Dynamics CRM 2011. I am confident I am not the only one to have bumped into this issue. Microsoft just confirmed to me that this is in fact a bug. I noticed that when viewing the sales pipeline funnel chart while user has another currency selected that it is not the base currency, the funnel is not rendered and the user is presented with a blank chart. I opened an incident with Microsoft and they managed to replicate this issue. It seems that when the user selects a default currency that has a conversion rate lower than 0.5, the values in the sales pipeline funnel chart seem to round to zero; thus rending the chart useless. At the moment the “workaround” (note the quotes here) is to set a conversion value equal or higher than 0.5 (not really a workaround if you ask me). The feedback I got from Microsoft is that this issue will be fixed in the Update Rollup 4, which is scheduled for mid October/2011. I raised this issue on Microsoft Connect (ID 665233) on 27/April/2011. Here is my original post about this issue on the Microsoft forums. 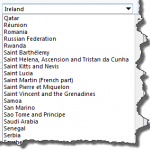 In Dynamics CRM, there is one particular bit that I always find myself customising, no matter the client size, region or industry: Country/Region fields. […]). But this can often lead to issues as options are added or removed from the list. One of the core concepts in Dynamics CRM concerning organisation management is Business Units. Business units are containers used to represent the business hierarchy, where the organisation created during the installation of Dynamics CRM is at the top (that is, the root business unit). Business Units are similar to an organisational chart, but not quite the same. Combining with other organisational management settings such as sales territories and sites, this can lead to a lot of confusion, and I’ve seen a lot of implementations where business units haven’t been properly considered. Views play a pivotal role in Dynamics CRM. Not only it is the main method with which interact with records of given entities, but it is also the foundation for creating charts.